Rhandirmwyn (pronounced ran-dee-mo-n) Club Site lies just outside the Brecon Beacons National Park. The name means ‘valley of the minerals’ and is a lead mining area in the Towy Valley. The campsite is situated in the middle of the valley and the lively River Towy run alongside it. The campsite is spacious and well set out with excellent facilities. Surrounded by hills and trees its ideal for families or individuals interested in walking, cycling or just relaxing. There are many beautiful hill and river walks within easy reach of this campsite. The Cambrian Way passes through the edge of the site. The circular all-ability access trail in Cwmrhaeadr Forest, one-and-a-half miles from the campsite is perfect for cyclists. There are two nice pubs in the village, your reward for completing the steep climb up to them! Head south from the campsite to the Usk reservoir in the National Park. An eight-mile trail wends its way around the shore. Fishing is available here too. The nearby Glasfyndd Forest also has great walking and cycling tracks. Llyn Brianne reservoir is also worth a visit. The road around the reservoir has some breathtaking views. Also visit the subterreanean world of the National Showcaves Centre for Wales. As well as the caves you can visit the dinosaur park, shire horse centre and the Iron Age village. The 13th century hillside Carreg Cennen Castle is south of the campsite near the village of Trapp. 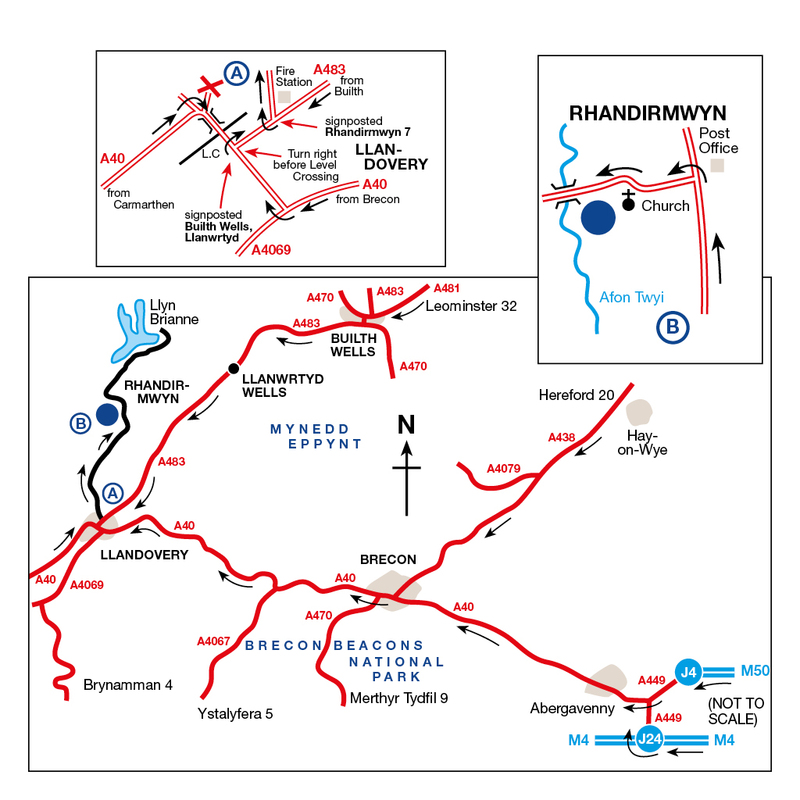 Do not follow your sat nav after Llandovery. No TV reception unless you have a suitable satellite dish. No mobile phone reception, payphone available on site. Lodges available for purchase or for let. There is now an on-site shop selling basic essentials and camping goods. Site is 7 miles from Llandovery. The self-catering lodge is open all year round. Fruit and veg van calls to site every Wednesday. Take a stroll through rural Carmarthenshire and pass rushing rivers and enchanting woodland. The Gwenffrwd-Dinas reserve is a birdwatchers paradise; keep an eye out for a glimpse of red kites, pied flycatchers, redstarts, common sandpipers, dippers and grey wagtails. Perched proudly atop a limestone outcrop, Carreg Cennen Castle is a 12th century fortification situated on the western edge of the Brecon Beacons National Park. The site exhibits evidence of late Iron Age defensive structures and boasts spectacular views of the surrounding countryside. First explored in 1912, Dan Yr Ogof is a vast complex of 16 caves stretching over 16 kilometres beneath the beautiful Brecon Beacons National Park. The Showcaves Centre is a truly unique natural beauty and has even been used as a filming location for an episode of Doctor Who. Providing wonderful scenery, swooping birds and bustling wildlife, the Brecon Beacons National Park is one of the best Welsh areas to visit. Ascend the formidable Black Mountains, explore forest and moorland and take to the water for wind surfing or canoeing.